It isn't every year that the biggest story to come out of the first round of the draft comes with the 25th pick, but, then, every year doesn't have Tim Tebow. The Broncos' decision to trade back into the first round and select Tebow will be one of the most scrutinized moves in recent NFL history. 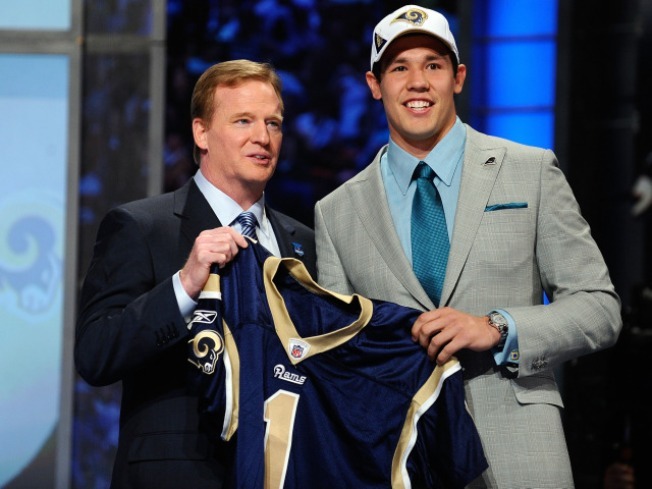 Sorry Sam Bradford. It might have started as your night but it ended as Tebow's. We all know about Tebow's off-field attributes. He's smart, works hard, says his prayers and eats his vitamins. All of that is great and none of it tells us anything about whether or not he can play quarterback in the NFL. The Broncos obviously think that he can because they traded second, third and fourth-round picks to take him and you don't do that for a glorified fullback who throws the occasional pass. If it works out, the gambit engineered by Broncos coach Josh McDaniels will go down as one of the greatest draft day trades in history. If it doesn't work out, McDaniels will be long gone by the time Broncos fans forgive him for mortgaging a big chunk of their team's future on a longshot when quarterbacks like Jimmy Clausen and Colt McCoy were still on the board. There is no middle ground here and it was the perfect story to headline the first prime time draft in league history. It was hardly the only story, however. Amid all their trades, the Broncos also picked up Georgia Tech wide receiver Demaryius Thomas with the 22nd pick. According to Ed Werder of ESPN, the reason they chose Thomas was because he reminded McDaniels of Brandon Marshall, the receiver they just traded to the Dolphins. It's an odd train of thought but, perhaps because of Denver's thin air, McDaniels is clearly marching to the beat of his own drummer. Perhaps that drummer can explain why you'd pick a receiver who specializes in deep patterns to go with an offense devoid of quarterbacks capable of throwing them. Something else that stood out during the first round is how little the conventional wisdom entering the draft held up. All year the word was that a very deep draft would preclude teams from giving up picks to move up in the first round. There wound up being seven such deals in the first 32 selections, including giant leaps by both the Chargers and Eagles to grab Fresno State running back Ryan Matthews and Michigan defensive end/linebacker Brandon Graham respectively. Those moves may have been surprising on the surface but they actually made a lot of sense. Both teams identified the player they most wanted in the first round and decided that they would rather secure him than hope to uncover a gem later in the draft. There will also be surprise tags placed on Oakland's choice of Alabama middle linebacker Rolando McClain and Buffalo's decision to draft Clemson running back C.J. Spiller with the eighth and ninth picks. They certainly don't match up with the mock drafts that blanketed the Earth in the last few months. But each player was, by unanimous consent, the best at positions you spend Sundays being told are vital to a team's success. If anything, the surprise was that the Raiders made a sensible choice for a solid player instead of their usual flight of fancy for someone no one else was going to pick until the fourth round. We'll save the report cards and winners and losers columns for later, other than giving an enthusiastic A-plus to the decision to move the first round to prime time. The draft has had a big-event feel for some time but setting the first round apart from the rest of the festivities amped that up a great deal. And, like any good prime time show, it ends with cliffhangers to be solved next episode. What will veterans be dealt now that their teams have replaced them? Osi Umenyiora of the Giants and Marshawn Lynch of the Bills seem like obvious choices, but the extra time to chat will probably lead to other big names finding new homes. For players like Clausen and McCoy, it sets up a brutal night of waiting and an irresistible storyline leading into Day Two. Will someone trade up for them? Great stuff and the fact that there's now no reason to spend a beautiful spring day cooped up inside is just icing on the cake.